As you know, I am passionate about children’s causes. The Global Team of 200 and Social Good Moms, of which I am a member, supports SOS Children’s Villages. a global charity which provides shelter, food and medical care to children living in crisis zones, such as Syria, Ukraine and West Africa. SOS Children’s Villages is the largest organization devoted to the care of orphaned and abandoned children. SOS Children’s Villages builds families for children in need, helps them shape their own futures and share in the development of their communities. We believe that every child deserves a loving home and family, and with that – an education and quality health care. With 545 villages in more than 130 countries and territories, SOS Children’s Villages is raising more than 82,000 children. In places such as West Africa, Syria and Ukraine, we currently operate 24/7 emergency relief services for affected children and their families. To learn more about SOS Children’s Villages, visit www.sos-usa.org. SOS Children’s Villages, Johnson & Johnson and the Huffington Post have launched Relay for Kids – a virtual relay that will help provide shelter, food and medical care to children in crisis. 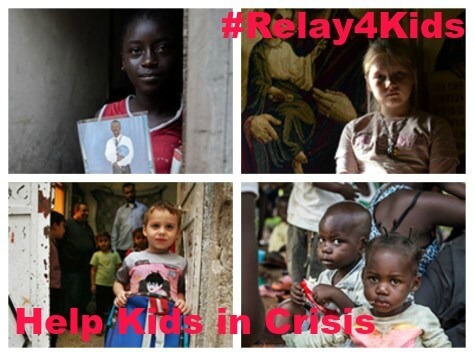 Starting March 23, child advocates from around the world began posting and sharing a series of stories on the Huffington Post as part of Relay for Kids, a monthlong virtual relay with a potential to raise up to $30,000 to help improve the lives of children living in crises. Millions of children worldwide are in dire need of food, medical care and a safe place to sleep at night. In war-torn Syria, 5.6 millions of children – roughly the population of Los Angeles and Philadelphia combined – are either caught in the line of fire, displaced from their home or living in poverty. Throughout West Africa, the Ebola outbreak has killed more than 10,000 people, leaving thousands of children without parental care. And in countries like Haiti and the Philippines, children are still experiencing the aftermath of natural disasters that have destroyed their families, homes, schools and communities. Launched by SOS Children’s Villages, sponsored by Johnson & Johnson and in partnership with the Huffington Post, Relay for Kids is helping to raise awareness about the plight of these children and inspire the world to take action. Every week, the Huffington Post’s Global Motherhood will feature three blogs that will focus on helping children in crisis. Relay for Kids blog participants include: Anne Geddes, world-renowned photographer; Dr. Jane Aronson, Founder and CEO of the Worldwide Orphans Foundation; Anne Goddard, President and CEO of ChildFund International; and caregivers from SOS Children’s Villages who have worked with children affected by crisis in places like Syria and West Africa. Blog posts shared via social media on the Huffington Post will trigger a $1 donation from Johnson & Johnson—up to $30,000*— to SOS Children’s Villages. The virtual relay will conclude on April 24 with funds going to SOS Children’s Villages to help provide shelter, food and medical care to children living in crisis zones, such as Syria, Ukraine and West Africa. In addition, people can upload a photo to Donate a Photo* and Johnson & Johnson will donate $1 — up to $20,000** — for children in crisis. *Blogs must be shared between March 23 and April 24, on Facebook, Twitter, StumbleUpon, Reddit, Tumblr and Google+ via the Huffington Post’s social media icons. Each share will trigger a $1 donation up to $30,000. There are no limits on how many times you can share a post. ** via the Donate A Photo app for iOS and Android. Johnson & Johnson has curated a list of trusted causes, and users can donate a photo to one cause, once a day. Each cause will appear in the app until it reaches its goal, or the donation period ends. If the goal isn’t reached, the cause will still receive a minimum donation.